ever since i was little i have always loved to create art. i create art for me, i never really feel the need to share drawings and paintings because i use art as an escape from reality. im able to express my thoughts passions and emotions without speaking. i feel free, theirs no guide lines, no boxes trapping you in, im able to use my imagination and connect myself. 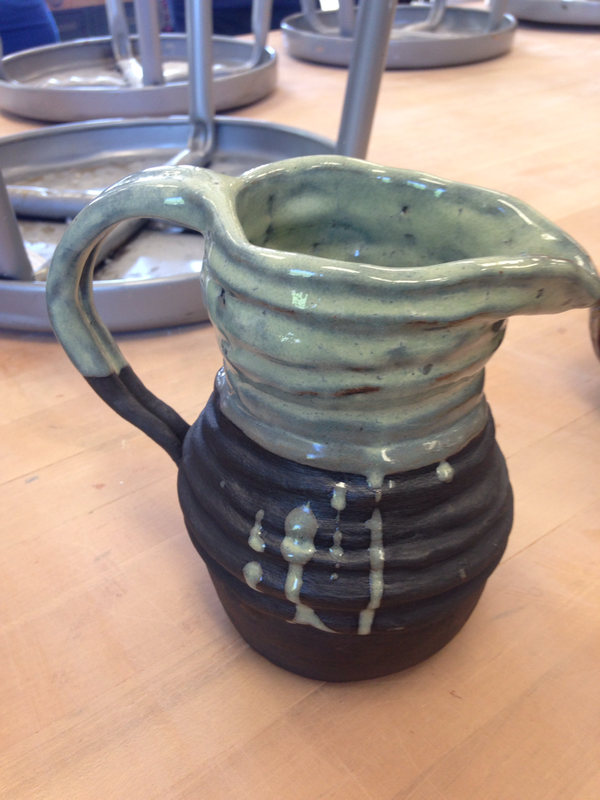 i decided to take ceramics this semester just for the fun of it. i was already in 2 other art classes, but i didn't really have an interest to take something other then art. i had worked with ceramics before but only a little bit in middle school so i knew the general idea of it, but wasn't sure if i would like it or not. i don't think i found very much passion in it compared to other forms of art, but when trying new techniques with the clay and seeing different things i could create i definitely grew into the class and ended up liking it. my dad as a high school student was really into ceramics creating some pretty cool stuff. that's definitely one of the reasons i wanted to try out the class just because i wondered if i would have any skill in it from him. 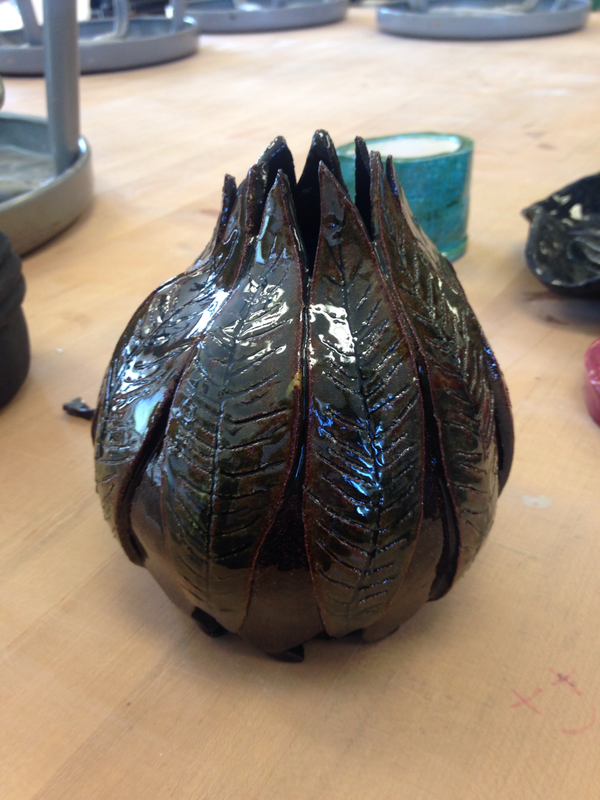 taking photography and painting definitely helped a lot with my ceramics this semester because i was able to use my creative skills to apply them into designs and structures for my pieces. 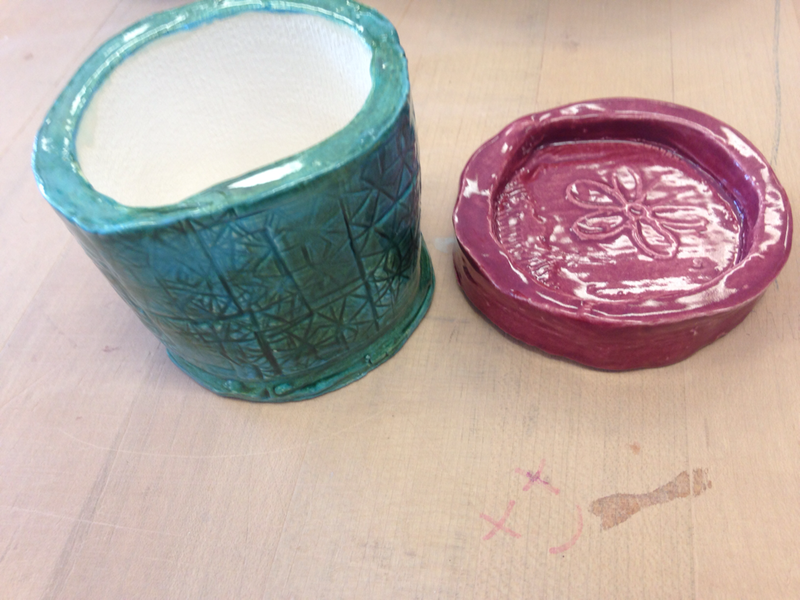 not having much experience with ceramics before this semester i didn't have a style or certain way i created pieces. through out the semester i was able to try out a lot of techniques and started to get an idea of what worked for me the best. only being in the class for a semester i dont feel gave me quite enough time to get comfortable with each technique, and looking back now i definitely wish i would have used some time at the begging of the class to get on the wheel instead of just focusing on slab and pinch forms. i only got on the wheel 3 or so times but even just with that little time i felt my self getting more and more comfortable and by the third piece i wasn't relying on the teacher for help as much as the first. if i were to continue on with ceramics i definitely think using the wheel would become a passion of mine. art has become a big part of my life mainly throughout this year. i find myself drawing and painting in my sketchbook almost daily and i feel like my work is getting better because of it. 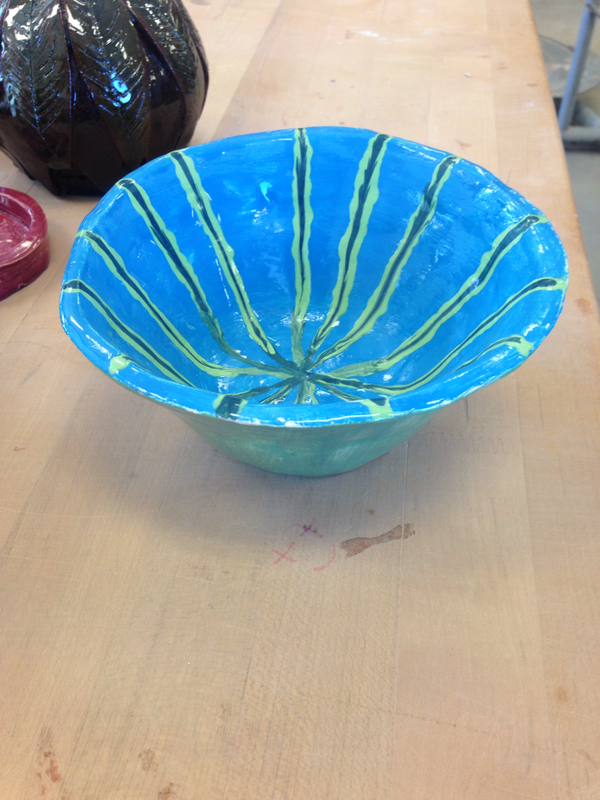 ceramics was new for me so i dont think i had the "ambition" for creating art like i do for painting drawing or photography, but im glad i took the semester to try it out and broaden my artistic skills to a knew subject matter and technique for creating art. moving forward i dont think i will work much with ceramics, but i plan to keep painting and drawing throughout high school and past, and hope to mix my photography into whatever carrier i will end up perusing. throughout the coil project we were asked to create either a pitcher tea pot and or bowl using layers of coils to create the shape and form. when i started creating i had an idea to create a vase but throughout the process of layering coils my form wasn't quite matching that certain form so i changed my initial idea to make it a pitcher. when layering the coils i had to create the round wide middle with i less wide neck and a spout at the top. it was challenging at first to get the coils to shape the way i wanted them but i got into the flow of it and ended up succeeding in getting the correct shape. i decided to not blend the coils together to create a smooth surface and instead kept them showing adding a bumpy look and texture. because i wasn't blending them i had to make sure when scoring them together i didn't leave any place water could seep through. ​using slab construction forms i created a plate small pencil holder and a small coaster. the objective for this project was to create a bowl cup and or plate using slab clay and the techniques that create each form. we also had to design stamps we had to put onto at least one of the forms. 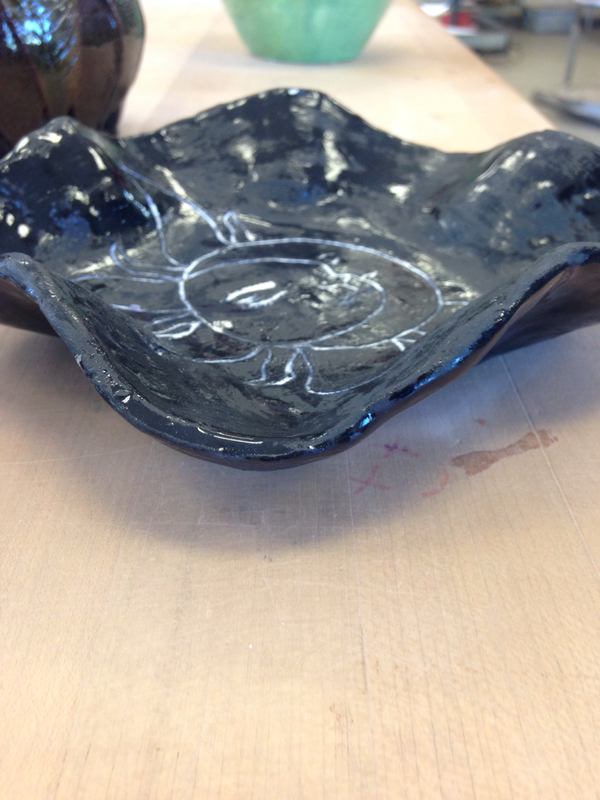 when creating my plate i layed a slab onto a shape of which i wanted my plate to take form of. i then bent the sides of it to create a wavy edge making it unique. i originally made a tall cup with a bunch of square cut outs on the sides of the form with the idea for a candles light to shine through them. before glazing the piece ended up breaking in half and i had to start over. because i did not have a lot of time i ended up just making a small cup holder using strips or slabs. i used my stamp on this piece to give it a line design and texture. i also used a stamp form on a small coaster or holder that i made. there was no straight guidelines set when going into the self directed project. as long as you demonstrated skills learned you could create anything using any construction method. after doing some researched i decided on a vase using both wheel and slab construction methods. i was inspired by pieces i saw on the internet to form the shape using slabs cut into leafs and sense i had not yet been on the wheel i wanted to incorporate that in so i decided i would create a small bowl shaped base for the form. after getting the base finished on the wheel i cut out large leaf shapes and scored them onto the sides of the base starting to form the vase. i then cut more slabs and layered them ontop to finish the shape of a vase. i feel my biggest challenge was creating on the wheel. i had never used it before this project so it took a couple tries and a lot of help to create the final base i ended up using. i am pretty happy on the overall final product and feel like i met all the goals i planed and followed my original idea until the end.